After fourteen-year-old Bobby Pendragon discovers that life is quite different from what he anticipated, he is taken quite quickly to a dimension known as Denduron where peculiar beings exist, where a magical despot rules, and where the territory faces a dangerous revolution. Reading Counts: Level 5.5 / 25.0 Points / 33257. 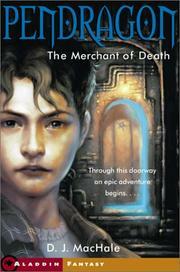 The merchant of death (#1 Pendragon) by D.J. MacHale. Accelerated Reader MG 5.0 18.0 66636. Reading Counts RC 5.5 25.0 33257. MacHale, D. J. Pendragon ; bk. 1.